You’ve seen him in his basic form, you’ve admired his beautiful feathers and now you can finally call him by name. 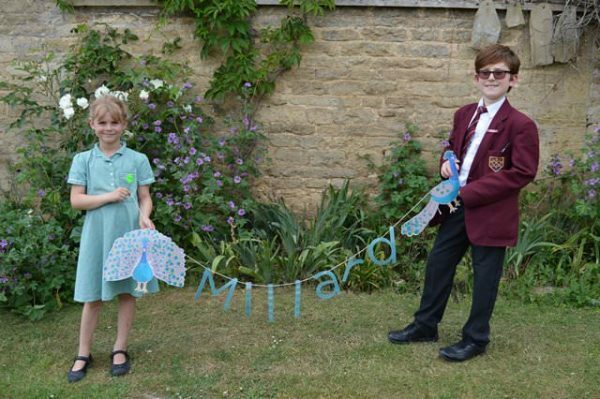 Meet Millard, Guardian of the Mill (Millard for short), designed by seven-year-old Mia Barham from Market Deeping and aptly named by Felix Higgins, 11, from Thornhaugh. It has been a long journey for Millard, who was first designed by Mia in a competition a year ago. He was then sent to a graphic designer who adapted Mia’s original drawing and brought him to life. In May we asked our visitors to choose a suitable name for him and were delighted with the response. Millard will be the new children’s mascot across the site at Sacrewell, highlighting interesting facts about the animals and adding a bit of colour into our interpretation. He will also be a feature in the shop, with keyrings, magnets and activity packs already on display. You’d better shake your tail feathers and get here to see him, before we sell out.